Smooth, unwrinkled clothing definitely looks smarter and more attractive adding an overall better impression of you. Giving some time and effort for a perfectly pressed outfit counts for a job interview or scoring a date too. By regular standards, you can opt to get fresh pressed wrinkle-free clothes through a Laundromat or drycleaner. You can also opt to get the old ironing board out and iron them yourself every day. However, the former will cost you and the latter needs time, effort and even skill. While ironing and the Laundromat tend to be the usual go-to solutions for wrinkle-free clothes, there’s actually another solution, steaming. See, this option gets you wrinkle-free clothes through a less complicated and less costly process. It’s also probably why different professional industries that often pack and move clothing (particularly fashion and broadcast) prefer steaming clothes. You can find a good variety of garment steamers on the market, and though different in features, they function similarly. Steamers use a water base reservoir or tank, which then heats the water to produce steam. A wide nozzle then releases the steam as you hover it over the fabric to de-wrinkle. With the high heat and steam to remove the wrinkles, you don’t need to apply pressure, not even direct contact. This means less effort and less time to getting clothes and fabric pressed and smooth. Moreover, it means reduced wear and tear and better safety since steaming safely works on almost any fabric. More than a smooth surface, steaming also sanitizes fabric without the use of chemicals. So overall, the best clothes steamers save money, time and energy while giving you better results than the usual solutions. So to help you buy the best models we’ve evaluated different garment steamer and chose the best based on specific traits. We consideredsteam production level, warm-up time, wrinkle-removal performance and durability as we picked out the best. Moreover, we referenced sources and industry leaders specializing in household cleaning as well as customer feedback, reviews, and personal experience. You’ll find our detailed review and recommendations below comparing our chosen clothes’ steamers. We’ve included one for different needs, preferences and budget range, so you can choose the best one for you. Great for wool, silk, cotton..
Coming from a brand dedicated to building the best steam products, the PurSteam PS-910 Fabric Steamer takes our top spot. This model provides perfect steam for 60 minutes without dropping temperature letting you work on a lot of clothes easily. See, its 61oz tank gives you enough capacity to finish a whole family’s worth of clothing without having to refill. There’s good reason why the PS-910 Fabric steamer makes it as one of the best sellers when it comes to fabric steamers. For one, it has a high capacity, handling heavy-duty volume despite not being a professional unit. Moreover, it quickly heats up for use in less than a minute and removes wrinkles effectively and efficiently. You don’t need to search for any other accessories when steaming clothes with this model. See, it comes with handy clips and an expandable hanger to hold clothing up as you steam. So, whether you’re steaming small fabrics, children’s clothes or pillowcases this steamer makes steaming easy and convenient for you. The hanger features a collapsible design for easy storage, while you can have the top hanger interchanged with a hook. Moreover, it includes a handheld steam board for de-wrinkling tighter details like collars, sleeve ends, and even pockets. Altogether, these attachments give it extra points for convenience while giving your clothes a smart appeal less the harsh lines. With a 248F steam heat, the PurSteam PS-910 does more than freshen up clothes fast, it sanitizes. This consistent flow of steam kills up to 99.9% of germs while allowing you to de-wrinkle any clothing quickly. Moreover, some users even note how this sanitizing feature applies well in disinfecting carpets too. This clothes steamer received a few critical reviews, but even then, the manufacturer replied to posted concerns with quality customer service. All things considered, the PurSteam PS-910 provides great value for money. While some find a minor concern on consistency, this model does great for both light and heavy jobs. Moreover, it comes with useful attachments that help support thorough and efficient steaming. A handheld steamer takes steaming to another level with mobility. This specially applies to frequent travelers, stylists and the like since they need something easy-to-use and quick to perform results. In this category, the small yet efficient Rowenta X-Cel Handheld Steamer takes our top spot. This model sports just the right size to quickly steam off wrinkles on the go. Packed to power-dress for a big day? This steamer quickly smoothens your whole ensemble from your tie and dress-shirt to your whole suit. A bigger steamer comes with higher capacity, but if you’re out and about, the X-Cel gets small jobs done well. Moreover, apart from portability, it’s easy to operate and quickly gets ready to steam with little to no fuss. See, in as quick as 40 to 45 seconds, the unit gets hot and ready to use. This steamer features a 1500-watt steam power that can run continuously for 10-minutes, while its included steam bonnet provides protection. Then, as you work on your clothes, the stainless steel head’s holes provide even distribution of heat and steam. Finally, to complete your ensemble prep process, this steamer includes a lint pad and a fabric brush. Rowenta’s steamer comes in a lightweight body and an easy-to-hold design and works well for regular use. Moreover, while this small steamer comes with a small tank, you’ll find that the even distribution makes it efficient. Coming at an easily portable size whilst providing excellent performance, this little Rowenta makes an excellent handheld choice. Moreover, its accessories help you achieve great results as you smoothen garments even when you’re on the go. Overall, this handheld steamer completely fulfills what a handheld steamer should deliver. Looking for a great performing garment steamer on a budget-friendly price tag? Then you need to check out URPOWER Garment Steamer. This travel-sized device weighs only 1.2 pounds but packs enough power to effectively remove wrinkles off your clothes. Moreover, it provides up to 10 minutes of continuous steam from its 130ml reservoir, ready to use in 2 minutes. URPOWER Garment Steamer removes stubborn wrinkles easily with its upgraded nozzle that evenly distributes steam with more power and consistency. This nozzle design takes it a step above its predecessor allowing it to handle a good volume of clothes. This portable steamer works great for travel needs and even comes with a travel pouch. And while this model won’t compare to heavy-duty models, it does well for everyday use. Moreover, if you prefer a lightweight unit, you can’t go wrong with this steamer. While this steamer comes in the budget category, it comes with nice features and great performance that many users appreciate. For one, it comes with an auto-shut-off function for safety from overheating or running on empty. Then, it also features electric leakage protection and high quality cord for added safety. Altogether, performance and design, apart from coming at an expensive price, makes it one of Amazon’s best-selling steamers. See, be it as a travel garment steamer or a simple handheld choice, many reviewers give it 4 and 5-star ratings. The URPOWER Garment Steamer proves that cheap doesn’t have to mean cheap performance. Moreover, apart from performance, it comes with safety features for added value. All that capped with a 2-year warranty, you just can’t go wrong with that. Sporting a small and simple design, you’d be surprised with the J-2000’s capacity and power. See, this mode can handlea heavy-duty steaming load at home up to even light commercial use. The J-2000 Jiffy Garment Steamer features a detachable 0.75-gallon water tank that lets the unit run for up to 1.5hours. It delivers consistent steam and heat during this time powered by its 1300-watt solid brass heating element. Moreover, it comes with a no-drip check valve system and an auto shut-off feature for safety. Even with that huge amount of water from the tank, the J-2000 gets ready in as quick as 2minutes. Moreover, it features a wide 6-inch path allowing you to go over a wide amount of fabric all at once. Imagine beddings and table linen steamed and wrinkle-free in a minute or two. This wide path and 5.5 foot hose also makes this steamer useful for other applications. For one, some customers use it to remove wallpaper easily. Meanwhile, some have used to it refresh their carpets too. This standing steamer model gets an added layer of protection with its high-impact polymer housing making it durable. Many reviewers note how the J-2000 has proven its durability over an impressive time. Even so, it comes with a 3-year limited warranty. Though a little heavier on the wallet, the J-2000 Jiffy Garment Steamer definitely provides great value for money. From powerful and consistent heating, to efficiency and durability it delivers outstanding performance. So, when it comes to heavier-duty needs, like for larger families or small commercial use, this model delivers. Though normally size comes first for a travel gadget, we still found that this mid-sized model stands out the best. See, while other handheld options come at smaller size, the OXA Portable Travel steamer impresses with its features and performance. As you would expect from a travel option, this steamer features a portable and lightweight design, weighing only 850g. So while bigger than others, this steamer won’t weigh take too much out of your luggage allowance. This makes it easy to travel-with and easy-to-use. To start off with its features, this model sports a sleek design with ergonomic features including a steady grip handle. Then it comes packed with a useful set of accessories giving it versatility and better efficiency. This includes two brushes: the usual fabric brush and a lint brush to clear way stuck fibers and lint. This travel steamer outshines other cheap handheld steamers when it comes to performance. See, it features 6 steam outlets for a strong and steady release of steam with a 1000watt power. Moreover, you can get it running in no time whenever you’re in a rush since it gets hot enough in as quick as 20 seconds. Packing all kinds of fabric? No need to worry with this steamer’s versatility. Whether you’re steaming the usual cotton, nylon blend or polyester blend, or packing silk, wool this steamer performs great. It can even handle organic fabric and any clothing or linen with embroidery easily without causing any damage. In addition to steaming a variety of materials, users also appreciate its sanitizing and odor-removing features. You’re sure to disinfect garments and kill germs with its high, consistent and even heat. Meanwhile, you don’t need to worry about overheating thanks to its auto shut-off safety feature. More than remove wrinkles, the OXA Portable Travel Steamer features a design considerate of ergonomics and efficiency. Moreover, for a small steamer, it features a 7-minute capacity for continuous steam powered by a 1000-watt heating element. So, altogether, with its high performance and useful accessories you’re sure to go out in pristine-looking clothes wherever you travel to. Our quest for the best budget choice meant not only finding the cheapest one, but onewith value for money. This we found with the Conair Extreme Steam GS23’s excellent feature-packed design that even includes add-ons to boot. See, while this mid-sized handheld steamer may not be the least expensive model, it provides a lot for less money. Similar to expensive steamers, the Conair ExtremeSteam GS23 comes with adjustable heat settings. This means you can change heat settings according to the best temperature for your fabric between low and high. Meanwhile, its built-in switch and triggerallows you to keep constant steam to your preference as you steam clothing or linen. A 1300-watt heating element powers this model’s steam released strong and hot enough to get through even thick and heavy garments. This power gets it hot and ready for use in as quick as 45-seconds, a minute less compared to others. Moreover, you can use it for a good 15 minutes with continuous steam thanks to its efficient easy-to-fill water tank. More than just giving you wrinkle-free clothes faster, it also makes them germ-free and bug-free. It has enough power to kill mites, bacteria, bedbugs and viruses giving you pristine, crisp and clean clothes. In addition to that, this steamer does all this work more efficiently than others thanks to its large brush size. And yet, there’s more! The Conair ExtremeSteam, GS23 also features removable brush attachments. This includes your basic fabric brush, a soft cushion brush for delicate garments and a creaser for pleats and folds. The only thing it doesn’t include is a hanger for clothing, so some users improvise. While not the cheapest, it definitely provides great value. Considering its multiple brushes, dual-heat steam options and durability, it beats even other expensive models. So compared to any under $30 option, this one makes the spend worth it. Looking for something more versatile? Then the Shark GS500 Professional Portable may just be the steamer for you. From cotton shirts, slacks, blouses, dresses, and skirts to your living room curtains and linen, this steamer de-wrinkles them all. Moreover, it gets the job done while looking great in its sleek, modern design. The Shark GS500 features a decent-sized water reservoir and comes with a long 15-foot cord. So,even with an entire room of curtains to work on, no need to refill or change outlets midway. This model sports a large size for travel so customers often choose it for household use. However, if your luggage space can afford it, it makes a great carry-on steamer especially for special occasions. For one, you can easily refresh the groom’s wool tuxedo and even the bride’s wedding dress for their big day. This steamer releases just the right of steam making sure to get rid of wrinkles without damaging fabric. You can even steam silk tanks and embroidered cushion covers without worries of damage. Moreover, it has enough power to do more than de-wrinkle it can sanitize fabrics too. The GS500 also comes with a Vertical Press Pad that many users love. This accessory lets you press on fabric for a crisp finish (as you would with an ironing board). On top of this, it comes with other helpful accessories including Velcro clips and bonnets to get great results. The Shark GS500 features high versatility for use in other parts of the household (not just clothes). Moreover, it features useful accessories to ensure you get the best results as you steam. On top of that, it performs excellently on various types of fabric while working efficiently in de-wrinkling. When we say best in portable, we chose something small yet powerful. See, this little steamer easily fits your suitcase or backpack and comes with a built-in 2-point cable. Meanwhile, small as it may be it gets rid of wrinkles even faster than some bigger models. Apart from super-fast de-wrinkling performance, this steamer features a quick heat-up time. It’s ready to use in a little over a minute and gives you continuous steam for as long as 9 minutes. Meanwhile, the unit features an ETL listed auto-shut off safety feature to avoid overheating. Note however, that this mini steamer doesn’t come with an off-switch so it’s best to unplug right after steaming your clothing. If this makes you doubt the quality of the product though, you’d be happy with its 5-year warranty. This coverage definitely beats most models in this price range. Overall, the Lemontec Portable Travel Garment Steamer gets the job done well. It features a simple design in a compact size and is very straightforward to use. Small yet powerful , this steamer makes the best carry-on choice for frequent travellers. However, it may be best for just that since without an off-switch it may be too troublesome for home use. Overall though, if you’re looking for the most compact yet well performing steamer out there, then you can’t miss the Lemontec Portable Travel Garment Steamer. Not quite ready to completely let go of the iron and ironing board yet? May be try something in between, the Bizond Portable Garment Steamer. This lightweight, portable steamer gives you the crisp finish you get from an ironing board, thanks to its surface design. And when we say portable, this unit takes up very little space in your luggage or backpack and only weighs 580gr. It measures only 7.8”x3.5” with a head 5.5” long, if that’s not small enough for you, try its mini version. You won’t need an ironing board with this steamer. Instead, you can hang the clothes at the closet door for steaming. Meanwhile, you still get excellent results plus the added benefit of avoiding damages to your clothing as well as sanitation. Many customers find this Bizond steamer easy to use. For one it warms up quickly, probably one of the fastest ones too, as it gets ready in 90 seconds. Then, as the water boils, you get a lot of steam to straighten any fabric off stubborn wrinkles. Then, with its 120ml water container, you get up to 10minutes of continuous powerful steam. That’s just as much as most mid-sized handheld steamers! Some customers even note how they can clean a full panel of drapes in one fill. The Bizond Portable Garment Steamer also boasts its unique spill protection design unique to this model. This means you can tilt the unit for up to 800 without having to worry about spills. See, other models tend to spew water at the wrong angle. Additionally, this steamer features an inner tank that keeps water from spilling from the unit’s housing. This shows how Bizond paid extra attention when it comes to preventing leaks and water spitting. The overall design may seem utilitarian and basic, but this steamer definitely has a lot to offer in performance and convenience. Plus, it comes with a 3-year warranty to boot! For a small steamer, the Bizond Portable Garment Steamer definitely performs like a bigger one. It heats up fast, lasts long with continuous steam and performs efficiently against fabric wrinkles. It’s probably why many users, travelers and home-users alike, enjoy using this steamer. If you’re willing to spend a little extra for excellent performance and build, then go for the PurSteam Elite. This steamer features superior parts and components, starting with its aluminum heating ball. Then it comes with a BPA free ABS/PP build for its housing making it more durable than most steamers. It has a large water tank with a 180ml, and with its 900-watt heating element, the unit heats up in one minute. Moreover, it has enough power for thin and thick fabrics easily from nylon blends to embroidered cushion covers and drapes. And with its 9-foot power cord, you have enough cord length to work on curtains or beddings. The PurSteam Elite may not be the smallest of the bunch but its compact enough for travel. IT even comes with a handy travel pouch. Many frequent travelers give it raving reviews for both performance and portability. A number of users received a defective unit that spewed out water while some had inconsistent steam flow. It’s worth to note that the manufacturer did reach out to unsatisfied customers to replace defective units. Overall, the PurSteam Elite is one excellent fabric steaming machine for both home and travel use. The manufacturer takes pride in its unique design and superior make and materials compared to other steamers. It’s not too much of a Splurge actually, just a little extra gets you an extra durable machine with excellent performance. When you first think about a clothes steamer, you probably imagine the traditional standing garment steamers. These have their water tank at their base and a nozzle held by a long hose for shooting out steam. Nowadays, there are more handheld garment steamer options. These ones tend to look like a kettle or oversized tea maker with a wide flat spout and comes with a cord. They hold water through a built-in or detachable water reservoir. Handheld steamers don’t come with a tube making them easier to maneuver around. Most models don’t seem to pack as much power and continuous steam time as a standing clothes steamer though. They make perfect travel garment steamers though and feature a wide variety of designs and shapes. Two key things to consider would be their heat-up time and steam time (length of continuous steam). Heat-up time often depends on the balance of the heating element power to its water reservoir size. Meanwhile, how long it produces steam consistently depends on the water reservoir size. While it seems straightforward, some models come with unique features in nozzle design, tank and heating element. Some also feature high grade components for parts and their heating element. These features then help them perform more efficiently in heat-up and steam production regardless of tank size ratio to power. Apart from these, you’ll want to choose a steamer that doesn’t spew out water. The steamer should produce consistent uniform steam, not shower all over your clothes. Moreover, if it fails in this aspect, it could also lead to injuries. Depending on where you intend to use your steamer, you may want to look for one with the right attachments. For example, some steamers come with a built-in hanger so you don’t need to hand your fabric separately. Meanwhile, some steamers feature attachments or a longer hose to improve your reach and achieve better results. Wet containers can build-up algae over time even with the heat. Apart from cleaning to avoid algae, steamers need to be decalcified every occasionally. See calcium deposits from water can build up in your steamer’s water tank over time. Regular cleaning not only helps avoid accidents, it helps your unit last longer. In this light, models with detachable water reservoirs make a better choice. However, there are models that come with cleaning kits and instructions for non-detachable water tanks. Detachable or not though, always make sure to follow cleaning instructions to avoid damage to your steamer. Considering that, you’ll want a model that has easy to follow and clear cleaning instructions. It could be safety features, wheels, brushes, a built-in hanger or even a steam board. When your chosen steamer comes with these additional features and accessories, you can achieve better results. Moreover, they make the steaming tasks even easier and more convenient for you. 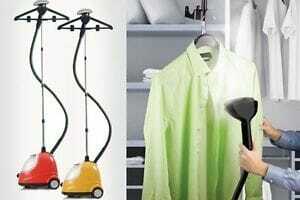 Garment steamers go for a wide price range from $20 to $200 (usually pricier than an iron). Travel and compact steamers tend to go for the lower price end, handheld options in the mid-range, then standing steamers. Price will vary depending on specifications of heat, steam time, brand and features. Steaming clothes need not be complicated, so it would be wise to spend only on what you need. Some pricey steamers may boast heavy-duty performance and added features, but it all boils that to what you really need.